Van Aanholt has made eight appearances since joining Sunderland from Chelsea this July. 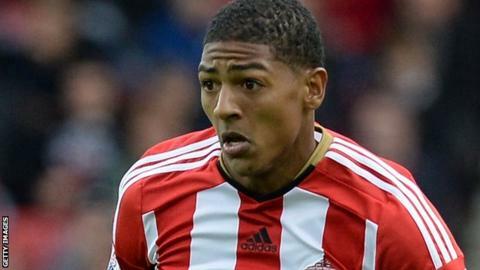 Netherlands defender Patrick van Aanholt says the whole Sunderland team can take credit for their improved defensive record this season. Gus Poyet's side have conceded just seven goals in as many Premier League games and only Southampton, with five, have let fewer in. "It's not just the defence, defending starts with the strikers. "It's the whole team that is doing very well, we're hard to beat," the 24-year-old told BBC Newcastle. "We're doing well - we need to keep it up." The former Chelsea player, who spent the last two-and-a-half seasons on loan at Vitesse in his native country, has been working one-to-one in training with assistant coach Mauricio Taricco, himself a former full-back. "Every training session we're working, he's giving me comments," van Aanholt added. "I'm trying to work hard and it's nice to have someone to help me learn - it's nice."